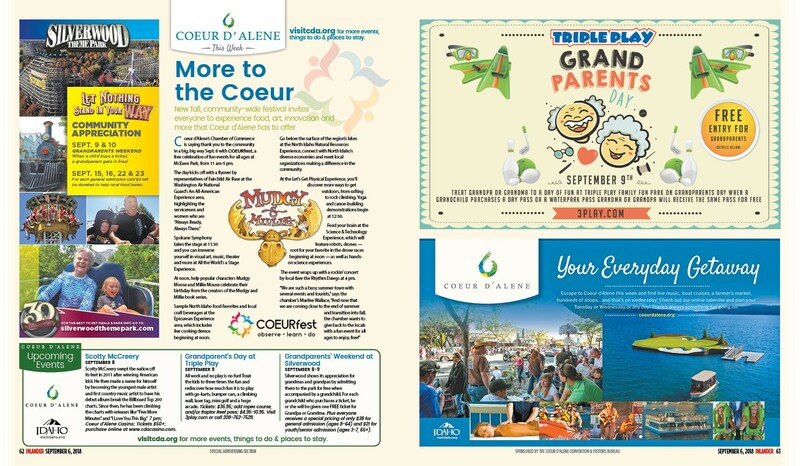 Coeur d’Alene’s Chamber of Commerce is saying thank you to the community in a big, big way Sept. 8 with COEURfest, a free celebration of fun events for all ages at McEuen Park, from 11 am-5 pm. Spokane Symphony takes the stage at 11:30 and you can immerse yourself in visual art, music, theater and more at All the World’s a Stage Experience. 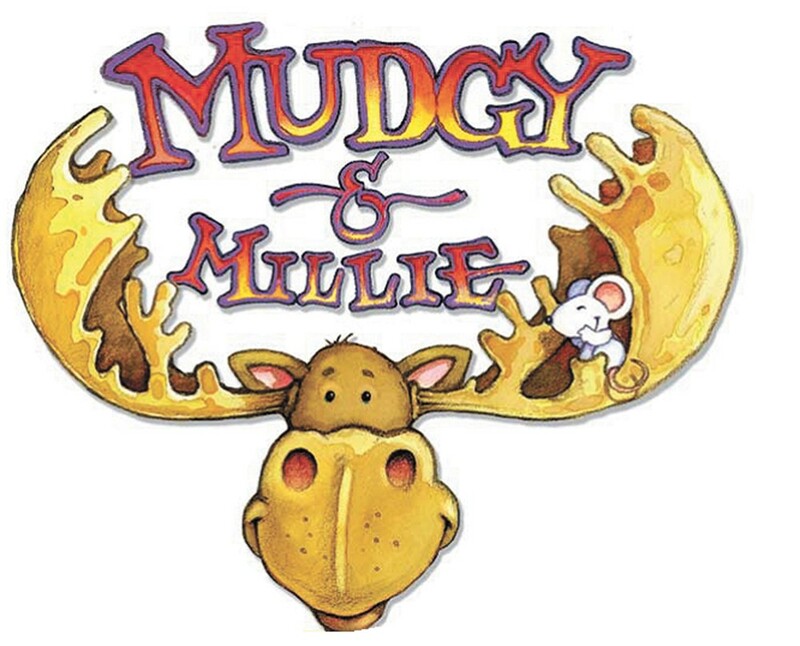 At noon, help popular characters Mudgy Moose and Millie Mouse celebrate their birthday from the creators of the Mudgy and Millie book series. Sample North Idaho food favorites and local craft beverages at the Epicurean Experience area, which includes live cooking demos beginning at noon. Go below the surface of the region’s lakes at the North Idaho Natural Resources Experience, connect with North Idaho’s diverse economies and meet local organizations making a difference in the community. At the Let’s Get Physical Experience, you’ll discover more ways to get outdoors, from rafting to rock climbing. Yoga and canoe-building demonstrations begin at 12:30. Feed your brain at the Science & Technology Experience, which will feature robots, drones — root for your favorite in the drone races beginning at noon — as well as hands-on science experiences. The event wraps up with a rockin’ concert by local fave the Rhythm Dawgs at 4 pm. Scotty McCreery swept the nation off its feet in 2011 after winning American Idol. He then made a name for himself by becoming the youngest male artist and first country music artist to have his debut album break the Billboard Top 200 charts. Since then, he has been climbing the charts with releases like “Five More Minutes” and “I Love You This Big.” 7 pm; Coeur d’Alene Casino; Tickets $50+; purchase online at www.cdacasino.com. All work and no play is no fun! Treat the kids to three times the fun and rediscover how much fun it is to play with go-karts, bumper cars, a climbing wall, laser tag, mini golf and a huge arcade. Tickets: $36.95; add ropes course, and/or Raptor Reef pass; $4.95-10.95. Visit 3play.com or call 208-762-7529. Silverwood shows its appreciation for grandmas and grandpas by admitting them to the park for free when accompanied by a grandchild. For each grandchild who purchases a ticket, he or she will be given one FREE ticket for Grandpa or Grandma. Plus everyone receives a special pricing of only $38 for general admission (ages 8-64) and $21 for youth/senior admission (ages 3-7, 65+).